Flyers embrace London, surge past Isles. At the John Labatt Center in London Ontario, the Philadelphia Flyers rebounded from a shaky outing against the Ottawa Senators on Wednesday, by systematically destroying the New York Islanders, 4-0, Thursday night in preseason action. Despite being out shot 11-3 in the first period, Flyers’ forward Mike Richards opened scoring midway through the opening stanza, when he received a pass from Joffrey Lupul and tossed the puck into the well-trafficked crease. The puck bounced off an Islander and into the net, giving the Flyers the 1-0 lead. In the second period the Isles youthful energy that powered them in the first period faded and the Flyers took over. Earning three consecutive power plays, Mike Knuble finally buried the man-advantage goal off a Bryan Berard pass, to give the Flyers the 2-0 lead. Later in the second period, London native, Jeff Carter made his homecoming sweet by putting the Flyers up 3-0, off a pass from Scottie Upshall and Berard. The goal was his first of the preseason. The Flyers out shot the Islanders 12-7 in the second period. With the game in hand, the Flyers notched one more power play goal for good measure, when Lupul took a pass from Richards and fired a wrister top shelf to give the Flyers the 4-0 victory. Matt Clackson was a willing participant tonight earning two fighting majors. He lost both bouts. Steve Downie dropped the gloves with New York’s Mike Haley late in the third period. Haley has the longer reach and wrapped up Downie’s right hand, while pounding the back of Downie’s head. The refs eventually stepped in without any big shots thrown. The Flyers have made the trip to London, Ontario a preseason tradition. 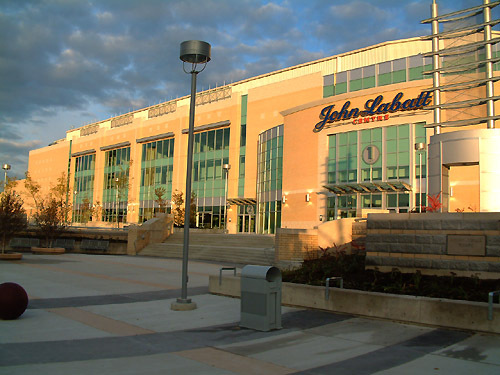 The reason is that the John Labatt Center is owned by the same group that owns the Flyers and despite it being a preseason game, the contest has been a sell out since the team began making the trip there. The Flyers’ next game is Saturday at 1 P.M. at the Wachovia Spectrum. It will be a celebration, featuring 11 previous Flyers’ captains.